Did that send shivers down your spine? Usually, it should. We’ve seen the old formula. A popular TV show or movie gets enough exposure to warrant a video game adaptation. In these adaptations, most companies rely on familiarity and customer loyalty (for proof of this, see nearly any licensed game review on the blog up to this point). This usually ends up in a hackneyed game pieced together from pieces of the source material and completely out of place situations for the sake of game play. Would it thrill you, then, if I told you that not every game taken from some other form of media was absolutely terrible? Anyway, the mechanics are simple. 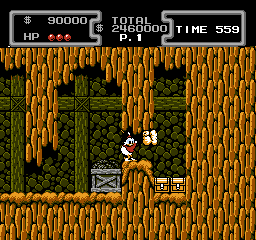 You run and jump, like any other platformer, but you can also use Scrooge’s cane in two incredibly vital functions: when met with certain obstacles, you can lean against them and swing your club to destroy them or send them at enemies or you can jump into the air and, with by holding down and a button press, it becomes a pogo stick which lets you bounce off of enemies, over spikes, and higher than you jump normally. Both of these will need to be mastered if you’re going to make it through Transylvania, the Himalayas, and even the Moon. Numerous jumping puzzles, passable ‘illusion’ walls, and branching paths to reach the boss of each level make for a very satisfying and interesting game to play through. 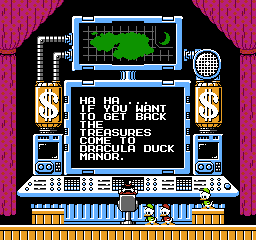 As you go through the game, you’ll also run into familiar characters from the show, of course, like Scrooge’s nephews, Huey, Dewey, and Louie. Those three don’t particularly help aside from hints at shortcuts, but other characters like Mrs. Beasley, the maid, and Launchpad, the pilot, offer food to recover your health and a way out of the level if you’re in too far over your head, respectively. If you can help to find Bubba, the not-so-bright caveman that tags along with the crew occasionally, he’ll give you an extra energy slot, which can prove incredibly useful. Where does this game lie exactly quality-wise, though? Well, while there are absolutely no glaring issues, the game does have a few minor problems. For one, the collision detection is a bit broad, forcing you to get hit by things that feel a bit off from where they feel they should be hitting. 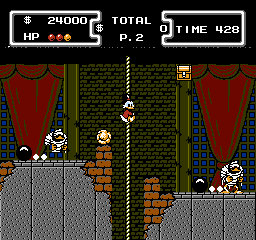 There are also a couple of jumping puzzles, mostly including mine carts, where the timing is terribly off and ends with Mr. McDuck taking a long plunge and losing unnecessary lives. Keeping the blurb on the game’s issues short is easy. The game shines with interesting locales, great mechanics that are easy to get and tough to master, and a gradual difficulty slope, which already puts it three rungs above most g ames on the NES. Add in the fact that this was actually an enjoyable source that the game was drawn from, and the impression the game leaves is pretty vivid. Each level has it’s own enemies that take different tactics to defeat, and each of the stages offers up it’s own unique challenge: the Amazon has a lot of vines to traverse in climbing puzzles while the Himalayas can end with Scrooge up to his waist in snow with the wrong jump. Starting from the top of the list of locales- as you can choose whichever level you want to play in whatever order- the levels do seem to get harder and harder. Even if you disagree, you can’t say that The Moon is not the hardest level of the six, and it is the last of them. It may have just been personal experience, however. Regardless, while most games have sudden unavoidable spikes in difficulty, this game actually feels like it adheres to some kind of linear progression. As a note, if both of these blurbs seem shorter than usual, there’s a reason. The game comes and goes pretty quickly, clocking in at about half an hour to forty-five minutes. There’s no save or password function, so if you die, that’s it. You start over. On the plus side, with a game that short, it’s not like you’d be wasting too much time by dying and starting again. The front end of the game is surprisingly well-done. The graphics are colorful, with characters looking as they should, well-animated enemies, and neatly designed levels, and the color palette is rarely boring. Even in certain levels where the screen is really made up of two to three colors and nothing more, it’s still a treat to travel through. I can’t really pick out anything I disliked as far as the graphics go, as everything really was done well, though still on par with the Nintendo graphics of the time. The music is catchy as hell. Anytime I’ve played this game, I had various themes stuck in my head, and I can still hear the music from the Himalayas level while I’m writing this review. Upon further exploration, I found that the theme from The Moon level is apparently regarded as one of the best themes from a Nintendo game. Bluntly put, the game’s soundtrack is delightful and tough to beat. If there was one gripe I have about the sound effects, though, it would be that some of them seem loud just to justify being more prominent than the background music. Particularly, when some enemies die, they emit a harsh sound that can be kind of harsh to the ears. Thankfully, it doesn’t put a damper on the rest of the game’s aural achievements. This game is a testament to how a platformer can make it through a large chunk of time and still be charming, challenging, and fun. If you’re a fan of platform games at all, I highly recommend picking up a copy of Ducktales and trying to cruise through it. With some fond memories of this game (and having been re-introduced to it a few years back by my best friend’s wife cruising through it at 100% completion in about twenty minutes), I’m glad I took the time to comes back to this one and play through it. A little of my faith in licensed games has returned. 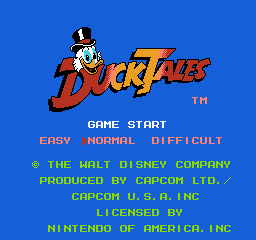 Ducktales also goes into the books as one of the greatest Remakes in history. The modern versions are absolutely excellent! I’ve heard awesome things about the Darkwing Duck game, so I think hunting it down and playing through it is going to have to happen soon.